Since I had no preconceived notions when preparing for this post, I just chose whatever kitchen and bathroom furnishings that caught my eye. So while most are unique and stylish marvels, a couple are clever design solutions created to address practical needs. From avant-garde one of a kind kitchens to spa-sational bathroom fixtures, these amazing products are all worthy additions to any home. Enjoy! 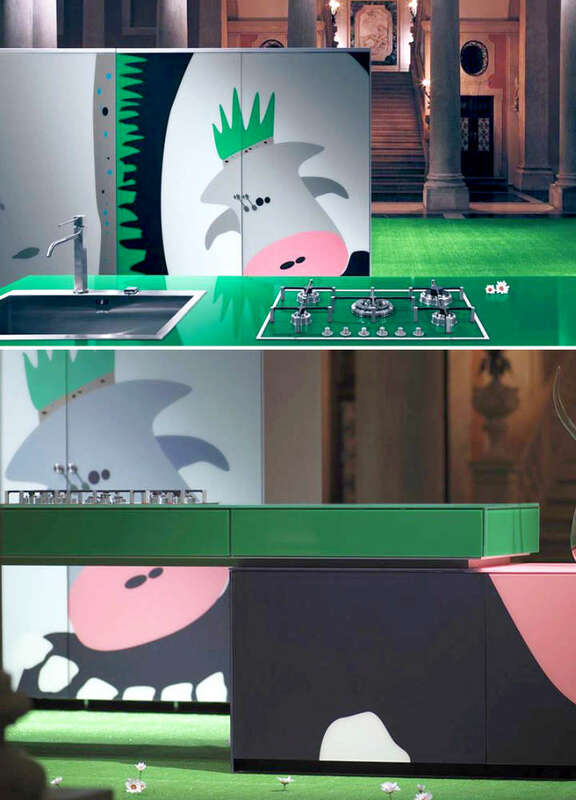 The perfect kitchen for pop or graffiti artists & their fans! From Valcucine comes this line of cabinetry that offers unprecedented personalization for your kitchen. Rooted in traditional Italian craftsmanship, Artematica Vitrum Arte uses a proprietary graphics transfer technique to put vector art on glass facings for doors, counter tops, sides and décor panels. 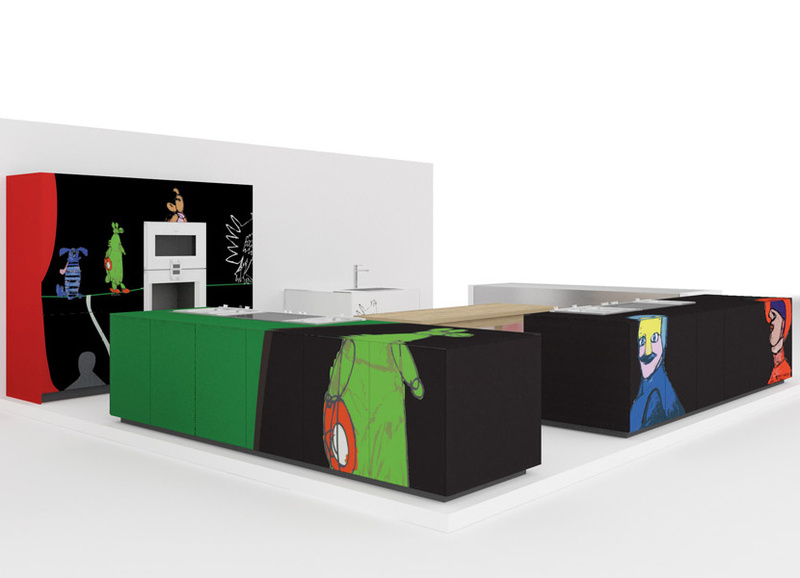 Explore the possibilities with your original graphics or hip art commissioned by Valcucine – it will be a blast either way. 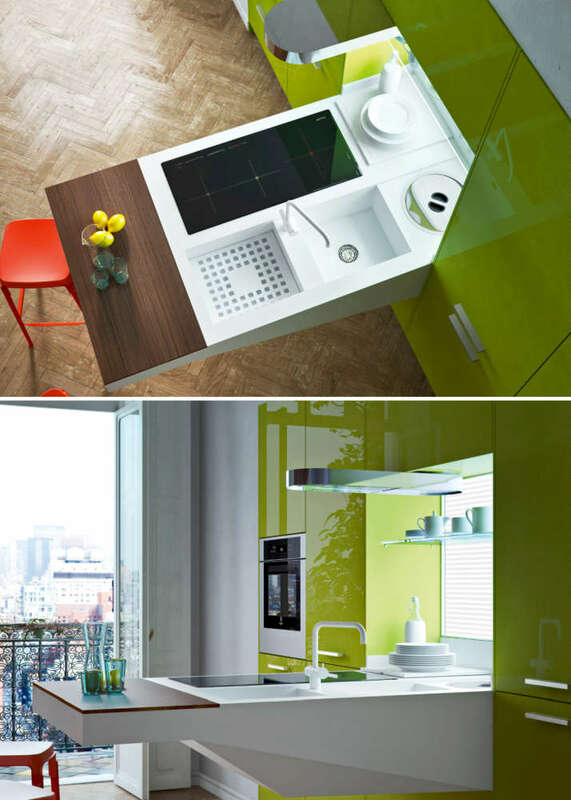 Glass Colors can be specified to match some of Italian manufacturer Smeg’s cooktops. Cheery and colorful, Chic Cow will certainly bring a smile to the young or young at heart. Closeup showing the glass décor panel in the dishwasher door. Aptly named ‘White and Black Nature’ the Vitrum Arte panels inject calmness and humor into this kitchen to counter the hectic pace of modern life. 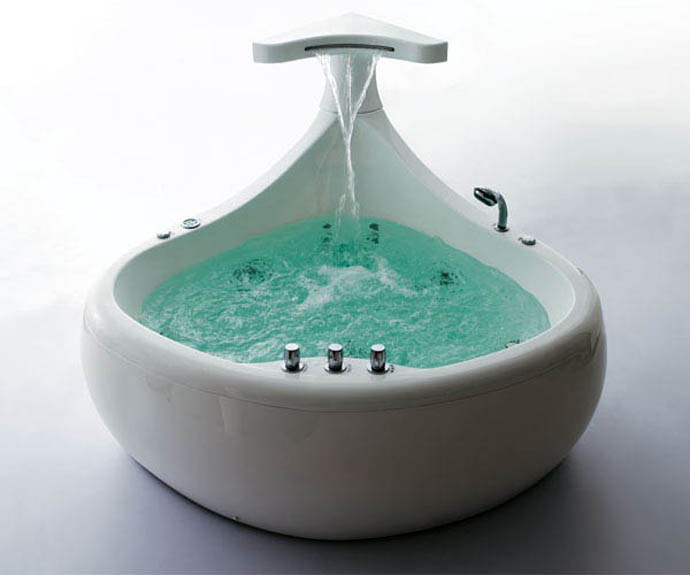 Unabashedly masculine bath tub for men with discerning taste. George by Falper is a perfect showcase for refined living. It draws on unusual and bespoke material combinations of glossy or matt Ceramilux, solid marble, sumptuous woods or luxurious hand-sewn Baxter leather, all trimmed with choice of copper, brass or stainless steel titanium. A dynamic contemporary kitchen with a small footprint. Snaidero‘s modular kitchen called Board is spunky, highly customizable and flexible. 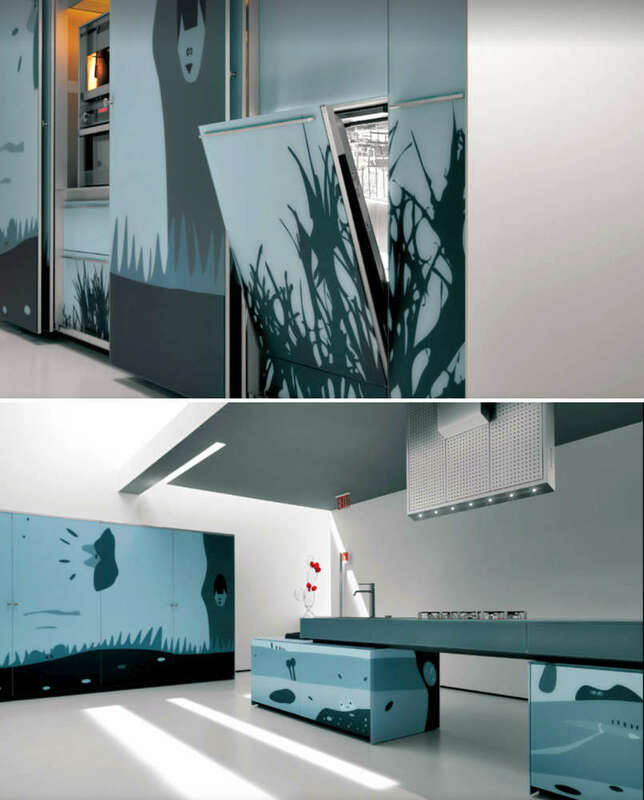 Intended for younger families, the kitchen, as often in Europe, is movable and new modules can be added to the next home. A celebration of Nero Marquina marble. 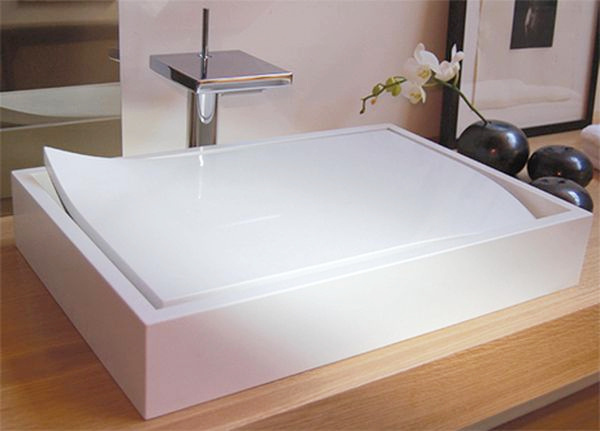 This Igiemme 2.0 sink by Davide Vercelli is an updated version of his original design. Being smaller, about 20” x 40”, and lighter, it can be accommodated in less palatial digs. 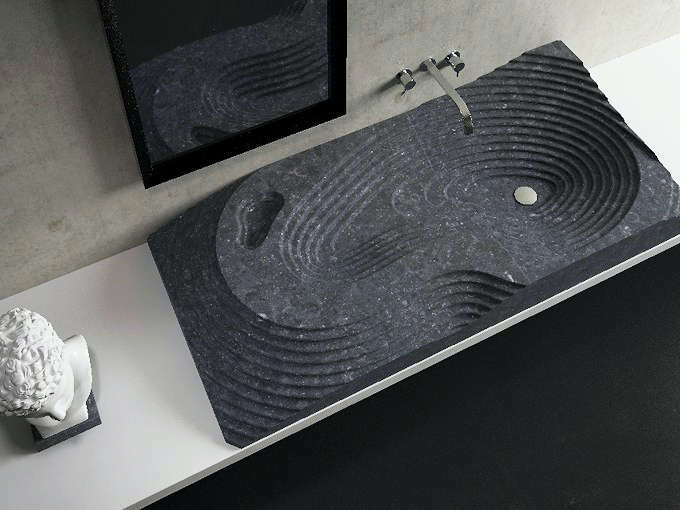 The sink’s fluid contours (which remind me of a topographic map) allow the classic black stone’s distinctive white and silver veins to be showcased to the max! Tired of stainless or white extractors? Try this pink-red show stopper! Elica is known for its leading edge range hood designs and the OM Air is no exception. As a reincarnation of OM, the world’s first vertical hood, OM Air offers new refinements, including a polyurethane anti-odor filter and 7W LED lighting on the bottom edge. Here’s an extra cool feature: the face of the glass-and-steel hood is completely flush when not in use, but the steel ring retracts for the fan to operate when on. Best of all, the extractor is available in 6 different colorways so feel free to unleash your creative genus! 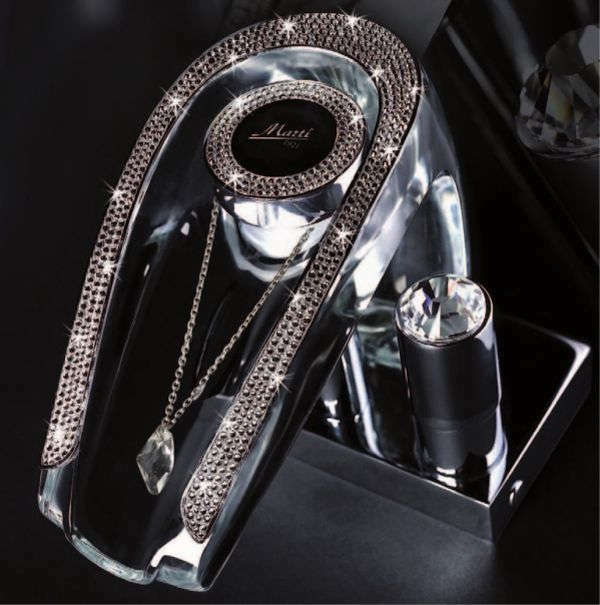 These are not diamonds, but the Swarovski crystal encrusted faucet will certainly garner as much attention. Spanish manufacturer Marti’s Niagara Vendome faucet series comes in 3 finishes to suite every décor! Aptly named Lotus, this sink will bring a bit of Zen into your space. 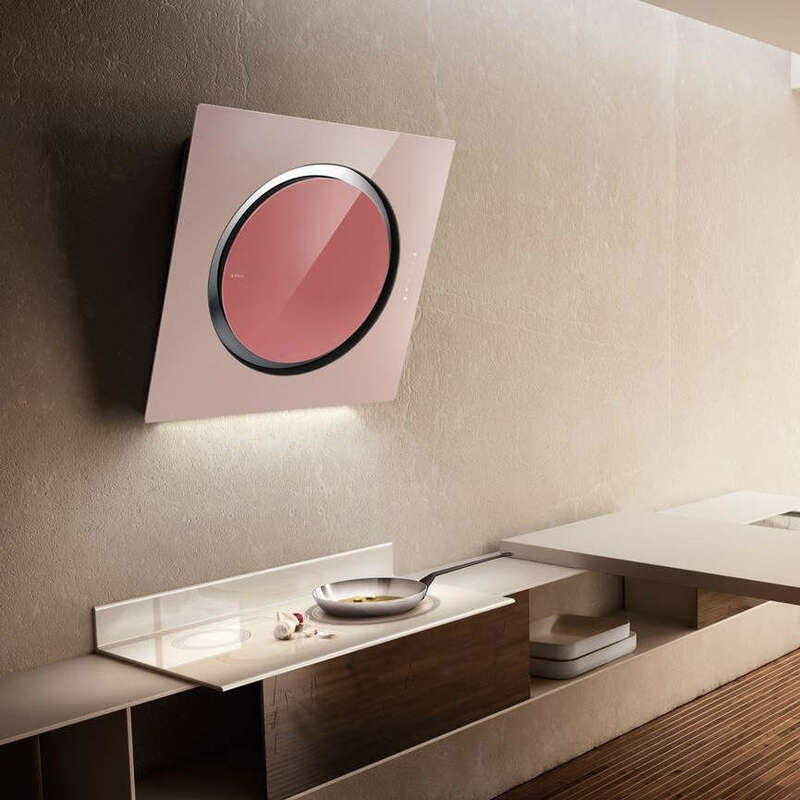 If over-the-top glamor is not for you, maybe this Lotus Vanity from Sonobath will keep you in the zone. Achieving seemingly the impossible, celebrity designer Jae Omar created this minimalist sink with delicately up turned corners from quartz slabs. Available in Brilliant White, White, Greystone, and Carbon Black, the sink will transform your bathroom into a spa with ease. Tight on space? Try a capsule kitchen! 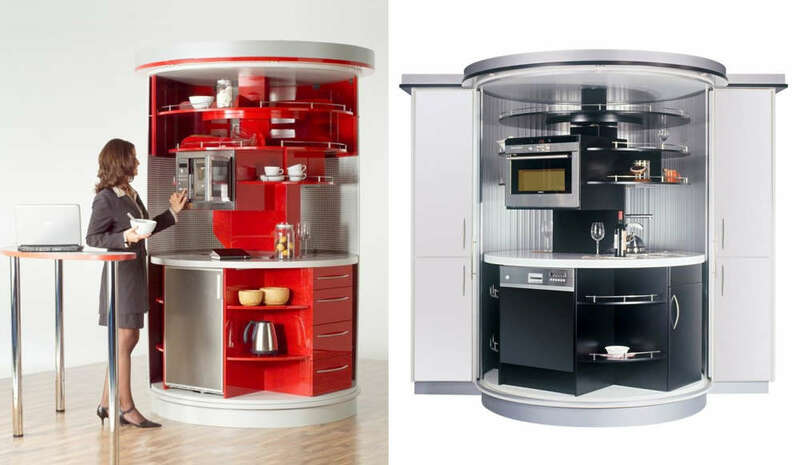 The Circle Kitchen rotates 180 degrees and takes less than 20 sq. ft. The small but mighty unit can provide about 10 feet of counter space and storage equivalent to 12 cupboards. It comes with a refrigerator, dishwasher, stove, range hood, microwave, oven, sink and trash can. I can see this fitting into micro housing units in cities with stratospheric real estate prices, like the Silicon Valley or Hong Kong, where 180 sq. ft. apartments sell for $517,000. A whale of a whirlpool tub!! 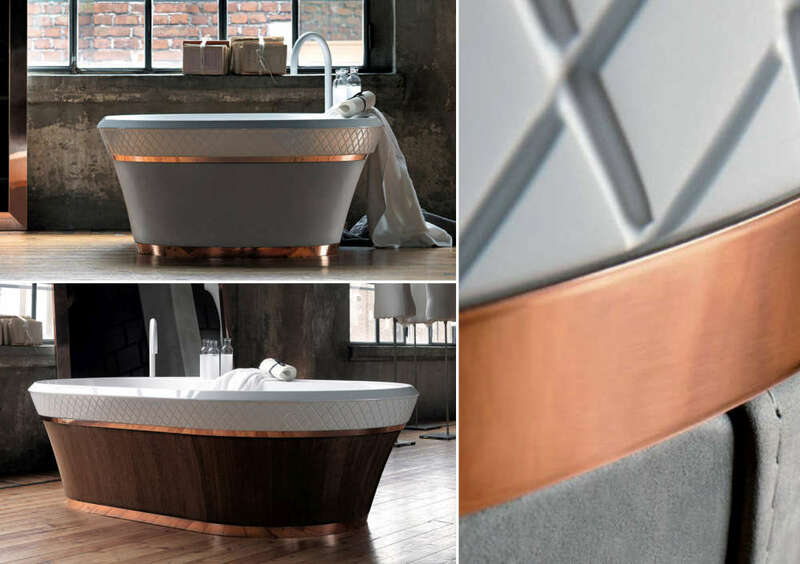 The Thalassor Baleina whirlpool tub creates an oasis with its organic curves and hi-arching water spout – which can arguably double as a water feature – to soothe the spirit. It also boasts a 512 color chromotherapy system for additional means to promote perfect health and harmony. This entry was posted in Kitchen & Bath Design and tagged Bath Tub, Bathroom Fixtures, Faucets, Kitchen & Bath, Kitchen cabinets, Range Hoods, Sinks, Vent Hoods by Marie Chan. Bookmark the permalink.